If you're like me, you normally buy your tires at Costco because of the service the Costco tire center provides. For the life of the tire, Costco is willing to provide free inflation, tire balancing, tire rotation, and flat repairs. Whether you buy Michelin, Bridgestone, or BFGoodrich tires, these services apply to all tires purchased from Costco. That being said, you should definitely take advantage of this Costco coupon deal where you buy any set of 4 Michelin tires and you get an automatic $70 off the total price. 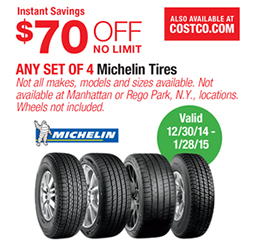 This deal is featured in the Jan 2015 Costco coupon book. If you buy any set of 4 Michelin tires for your car, you can get 70 off the total price which amounts to a good chunk of savings. This is valid from 12/29/14 to 1/28/15, so be sure to take advantage of this since most likely you can only get your tires changed during the weekend and it's always nice to have brand new tires during the winter months due to wet and slippery road conditions. Please note that a lot of Costco members get their tires from Costco that the wait just to get your tires rotated can be up to a few hours on Saturdays and Sundays.